Egypt Religion, Gods, and Goddesses - HISTORY'S HISTORIESYou are history. We are the future. Religion played a big part in the lives of the ancient Egyptians. Like other early civilizations, ancient Egypt was polytheistic. Polytheism is a belief in more than one god. As with so many other aspects of Egyptian culture, their religious beliefs were highly developed. The fact that the ancient Egyptians had more than 2000 gods and goddesses is a good example of the sophistication of their belief system. The ancient Egyptians were also very likely the first people to believe in an afterlife. If not the first to hold that belief, they were certainly the first to record their thoughts at such length and in such detail. To support that belief, the Egyptians developed elaborate burial practices to ensure that a person's body and soul stayed together in their journey to the afterlife and that the comfort of loved ones would be maintained. Above, Akhenaten depicted as the Sphinx. Several other things make ancient Egyptian belief systems unique. For starters, while most other ancient cultures believed in gods that looked more or less like humans, Egyptian gods and goddesses are depicted with the bodies of humans but the heads of animals. 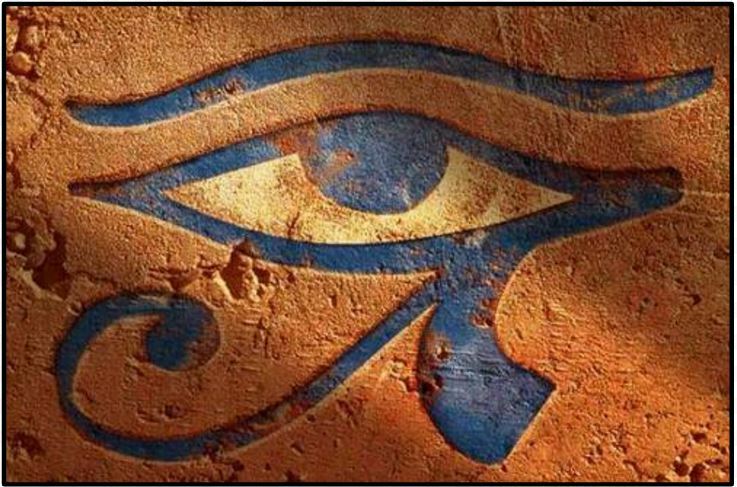 Additionally, while it is true that for the vast majority of their history the ancient Egyptians were polytheistic, for a brief time in the 14th century BCE all of Egypt worshiped only Atun, the Sun god. That makes Egypt the first monotheistic religion in world history. The Pharaoh at the time, Amenhotep IV, so strongly believed in the worship of only Atun that he made it the state religion and changed his name to Akhenaten to reflect his personal devotion to the Sun god. He also had any plural references to gods struck from Temple carvings throughout Egypt. It seems radical, and it was. But then Akhenaten, in addition to being the father of King Tut, is one of the more interesting figures in Egyptian history. What are three ways Egyptians honored their gods? Temples: While the Egyptians had more than 2000 gods and goddesses, most of those were local gods worshiped only by regions, cities, or even families. Because they were only infrequently written about and typically did not have grand temple complexes devoted to them, little is known about these local deities. In fact, of the over 2000 gods and goddesses of ancient Egypt fewer than 100 were honored on a national level. Those more important gods, however, filled Egyptian stories and were the inspirations for some of the most fabulous building projects of antiquity. Many Pharaohs built large temples to honor their gods. These temples were really more temple complexes. They had large statues, gardens, memorials, and a place of worship. Towns would sometimes have their own temples built to honor their own local gods. More frequently, the local village gods were worshiped at small shrines in the village or at private offering tables in the houses. Left to right above, Egyptian temples at Karnak, Luxor, and Philae. 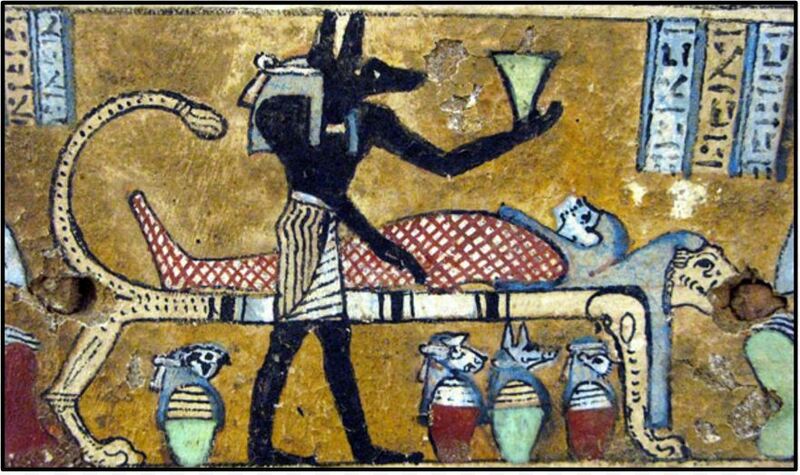 Anubis served as guide to the afterlife. Above, Anubis does the weighing while Thoth records the results. In the middle is Ammit, the devourer, hoping for poor results. Some famous temples include the Luxor Temple, the Temple of Isis at Philae, the Temple of Horus at Edfu, the Temples of Rameses and Nefertiti at Abu Simbel, and the Temple of Amun at Karnak. In the religious beliefs of ancient Egypt, the temples were believed to be the dwelling places of the gods and goddesses. Because of that, only priests, priestesses, and the Pharaoh, the Queen, and occasionally other members of the royal family were allowed inside the temples. Ordinary Egyptians could only go as far as the gates. ​Inside the temples, offerings were made. Typically, offerings were items that were used in Egyptian daily life and included such things as bread, beer, wine, meats, clothing, incense and perfume, and fruits and flowers. Egyptians also honored their gods by holding festivals. During festivals, statues believed to be the embodiment of the deity being honored were brought out of the temples. Because festivals gave Egyptian commoners a chance to see those sacred statues, religious festivals were a celebrated event. Afterlife: The Egyptians believed that there was a life after death. They thought that people had two important parts: a "ka", or life force that they only had while alive, and a "ba" which was more like a soul. If the "ka" and "ba" could be united in the afterworld the person would live in the afterlife. A key component was that the body had be preserved for this to happen. This is why the Egyptians used the embalming process, or mummification, to preserve the dead. Why are creation stories important? In the Beginning: Most ancient civilizations have a creation story. What is a creation story? A creation story is a story about how that civilization was created, how it began. Creation stories are important because they help explain the natural world and a human's place in the natural world. Beyond entertainment, creation stories often hold deep lessons about the world. In ancient Egypt, there are several creation stories. ​The Legend of Isis and Osiris is one of those stories. In Egyptian mythology, Ra travels through the underworld each night so that he can rise in the east the next morning. Out of the lotus flower bloomed the god, Ra. Ra flew into the sky and became the sun. The lotus blossom closed each night, tucking Ra in for a safe and warm night’s sleep, and each morning the lotus flower opened once again so that Ra could come out and play. Ra dried up much of the water and made the land. Ra was lonely, so he made a wife. He named her Nut. Ra made many gods and goddesses to keep him company. He put them all to work. His children were very busy running the world. Still, they took time out to have children, because children were glorious things to have! Soon, there were many gods and goddesses. Ra was the father or the grandfather or the great-grandfather of them all! All children are glorious, but to Ra, one child was especially important. That child was his grandson, Osiris. Osiris had a brother named Seth. Ra thought Seth was okay, I suppose, but his favorite by far was Osiris. According to legend, why does the Nile rise? To show Osiris how much he was loved, Ra made Osiris the first Pharaoh of Egypt. Osiris married Isis, his one true love, and King Osiris and Queen Isis settled down quite happily with their son Prince Horus. Seth was prone to anger and was, therefore, known as the god of chaos. Watching his brother rule all of Egypt made Seth terribly jealous. Why should Osiris be named Pharaoh and not him, Seth wondered? In a fit of anger, he killed his brother Osiris, and chopped him into little pieces. He threw the pieces into the Nile River. When Isis heard what Seth had done she quickly gathered the pieces and brought them to her good friend Anubis, the jackal-headed god (pictured top, right). Anubis was very clever. He managed to put the pieces of Osiris together again. But he did not have the power to make him human again. When Ra heard about Seth's actions, he was furious. He gave Osiris a new job, an even better job. 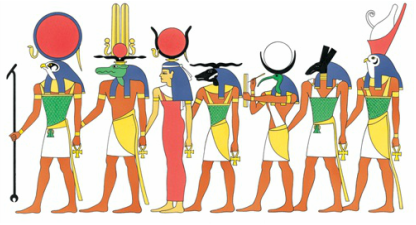 He made Osiris the god of the dead which, for the Egyptians, was a most important job (middle, right). Although he was only a boy, when Horus heard about the murder of his father, he tracked down Seth and avenged his father's death by killing him. Isis was grateful to her friend Anubis, and to her son Horus, and to her grandfather Ra. But nothing anyone could do would bring Osiris back to her. Osiris would live forever in the land of the dead, and she would live forever in the land of the living. Isis knew that she would never see her beloved husband again. In honor of the god Osiris, the kings (pharaohs) of Egypt carry a crook and a flail, the signs of Osiris. The crook especially became the sign of rulers. The crook looked a great deal like a snake and was made out of wood. They used wood because wood was scarce. That made it even more special. From the time of Osiris's death, and even today, once each year Isis travels to the riverbank. Remembering and dreaming, tears fall from her eyes. That is why the Nile River rises each year, to bring life to everyone and everything along the Nile. When Isis cries, the Nile will rise! And that is a very important thing. Anubis having stitched Osiris back together. Osiris, left, was made god of the underworld. 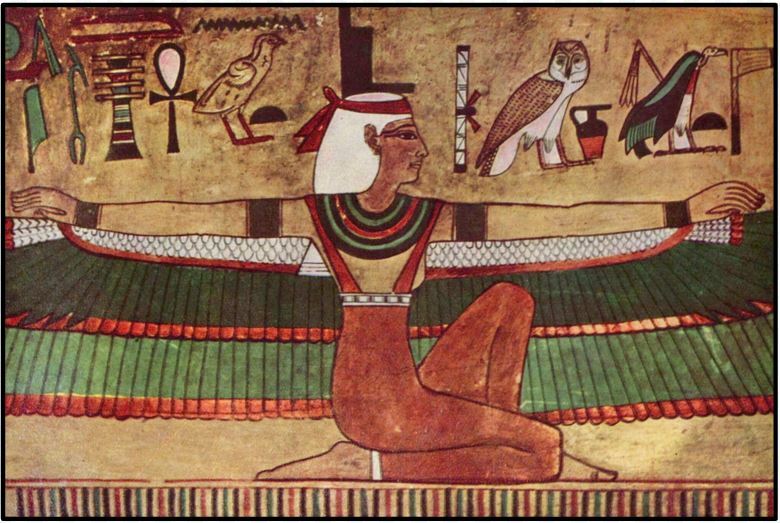 Isis is often pictured as a bird of prey whose shrill cry reminded them of grief-struck sobbing. BRAINBOX: What do the crook and the flail symbolize?